As the skin around the eyes is the thinnest on the face, it’s only natural that it’s the first to show signs of aging. Over time, collagen production plummets, fat deposits deplete, and aging skin becomes more lax. While most people think that surgery is the only option to achieve a more youthful complexion, it isn’t. There is a number of non-invasive treatment options nowadays designed to tighten and lift skin. Think of it as a non-invasive face lift for the delicate eye area. Here is an overview of these skin tightening treatments and how they work. BTL Exilis Ultra is a US FDA-cleared skin tightening treatment that combines the effectiveness of ultrasound technology with radio frequency to enhance collagen production and tighten loose skin. Exilis skin tightening uses a small hand piece that emits heat energy to reach deeper layers of skin. The heat stimulates collagen production which restores volume, softens wrinkles, and tightens skin around the eye area without surgery or downtime. Ultherapy is a non-surgical ultrasound procedure that uses the body’s unique regenerative response to counteract gravity’s effect on the skin. It works by using time-tested ultrasound energy to stimulate new collagen that lifts and tightens the skin from the brow, face, and jawline, to the chest. Similar to the look of a surgical eye lift (but not as pronounced), Ultherapy provides a non-surgical brow lift by gently and gradually lifting the skin on the eyebrows for a naturally wider-eyed appearance. Currently, Ultherapy is the sole non-invasive skin treatment approved by the US FDA-cleared as well as a European CE mark to safely and non-invasively lift and tighten skin. 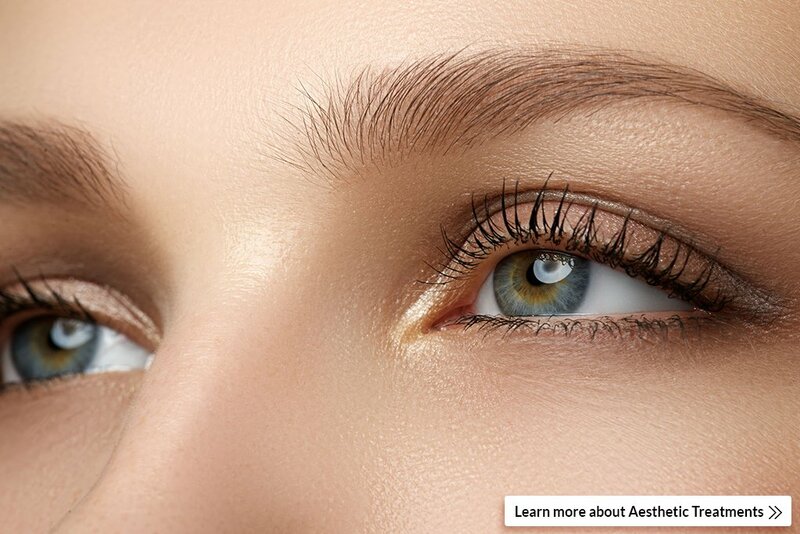 If you are tired of looking tired because of your eyes, dermal fillers may be right for you. Dermal fillers are useful for “filling in” areas of the face, such as the area around the eyes giving a youthful and refreshed look. In Cutis Laser Clinics in Singapore, we use Juvederm (hyaluronic acid) and Radiesse (calcium) filler which is FDA-cleared safe and effective. Hyaluronic acid and calcium are safe as they occur naturally in the body including the skin, resulting in a soft, full and natural look. Fillers can be used to reduce the appearance of eye bags or the lines under the eyes caused by volume loss, sagging skin or due to the sunkenness of the lower eyelid area. Juvederm Volbella is an ideal under-eye area filler as it is a very light filler that molds very well within the surrounding tissues. Fillers can also be used to lift the brows by injecting fillers directly under the brow to lift the eyelid, creating a broader ledge for the upper lid to hang from. While fillers cannot achieve the same results as surgical eye lifts or facelifts, they can temporarily improve facial aging for more youthful looking skin. Dermal fillers also have other uses, such as softening wrinkles, improving the appearance of recessed scarring, restoring volume to the cheeks, filling in the lips and increasing the height of the nose bridge. Botox has quickly become of the most popular non-invasive procedures for the skin. The US FDA-cleared fast and efficient procedure is designed to remove wrinkles by relaxing the muscles responsible for forming the creases. When administered by a trained and certified aesthetic doctor like Dr. Sylvia Ramirez, the procedure is safe and offers nearly instant results. The dosage of your Botox treatment in Singapore will be dependent on the strength of your muscle. Botox cost also varies as some aesthetic clinic offers by area while some by units. But make sure that you pay only for what you use. It takes at least two weeks to see the full effects of a Botox injection and side effects are normally redness in the treatment area. While there’s no stopping the aging process, there are things you can do to slow it down and reverse its effects. Non-invasive skin treatments are quickly gaining momentum in the beauty industry due to their effectiveness and ability to offers quick results with minimal pain and downtime. These procedures are especially sought-after among men and women with loose or saggy skin around the eyes who do not want to undergo surgery but desires a natural rejuvenation. If you want to learn more about any of the non-invasive skin treatments mentioned or are ready to schedule an appointment, contact the Cutis Laser Clinics in Singapore today.